The advent of e-mail gave marketers a powerful, cost-effective way to communicate messages to potential new customers. However, most all communications directed prospects to the company website home page. Unfortunately, this strategy was flawed because marketers couldn't really measure which campaigns effectively generated traffic. In addition, prospects who did click through to the website had to hunt for the information they sought. If that took too long, prospects would leave adding to a high "bounce rate". Nevertheless, marketers rushed to flood marketing messages to prospects via email. They purchased, sold and shared e-mail lists as part of the e-mail "gold rush" era. Consumers became increasingly annoyed at the random volume of commercial e-mails filling their mailboxes. Mature, retired women received invitations to buy Viagra online, just as teenage men were sent links to purchase feminine hygiene products. It was the wild, wild Internet west, until in 2002, the European Union introduced laws prohibiting the use of e-mail addresses for marketing purposes, unless they provided consumers with an "opt-in" feature and an opportunity to be removed from lists. The CAN-SPAM Act of 2003 in the United States authorized a US$11,000 penalty per violation and prompted many commercial e-mail marketers to utilize a service or special software to ensure compliance with the Act. With these restrictions, Digital Rainmakers learned that a better method of tracking e-mail marketing efforts was crucial. Service providers began to provide statistics pertaining to the number of messages received and opened, and whether the recipients clicked on any links within the messages. Today, e-mail marketing is known as one of the best ways to customize brand relationships with customers. Campaigns are targeted and refined with each customer interaction. One of the most effective tactics leading the evolution is the personalized landing page. According to the Direct Mail Association (DMA), nearly 33 percent of people respond to direct mail by going online. The industry has responded by creating unique landing pages that can be used to provide personalized marketing offers to prospects, conduct surveys, distribute coupons, manage event registrations, and more. 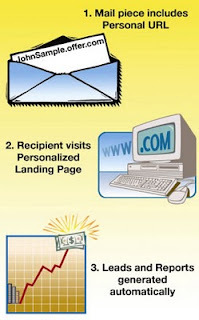 Personal Landing Pages are reporting a 20 to 30 percent increase in response rates. Those outstanding response levels have led to the development of customized purchasing data, enabling Rainmakers to provide promotional product offers that are specifically within your area of interest and/or need. And this fine-tuned intelligence is helping marketers focus on what works.